There are a lot of commercial and residential door and automatic gate operators on the market. We have accessories, parts, and the expertise to maintain nearly all of them, but when we need to replace an operator or are furnishing a brand new door installation, we install LiftMaster. There are a number of reasons for that decision, and they include LiftMaster's longstanding commitment to quality, as well as their continued dedication to innovation and full range of solutions. It's for these same reasons that we are proud to be Maui's only Authorized LiftMaster Dealer. 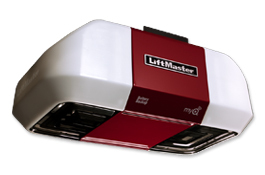 LiftMaster has been the industry leader for residential, commercial, and gate operators for over 45 years. With this long history they've developed and maintained important advancements in safety, quality, and innovation. Nearly all of their operators include a lifetime motor warranty, as well as an additional 1-5 year warranty on parts, depending on model. Their patented P3 motors also include the latest safety features, including optional battery back-up on select models, ensuring safe operation for your family, pets, and guests. Not content with having some of the safest and most reliable operators, LiftMaster recently introduced their MyQ technology. We've discussed this technology some previously. MyQ brings full connectivity to your garage and home to your smartphone, tablet, and computer, allowing for ease of use and peace of mind. From anywhere in the world, you can know whether your door is open or closed, and even operate the door remotely to allow for package delivers or the entry of a guest. For additional information on LiftMaster's history, products, and future innovations, please visit their website. In celebration of our partnership with LiftMaster, we're offering $50 off of ANY LiftMaster operator and installation package, as well as 10% off of ANY LiftMaster accessory. Use promo code LIFTMASTER when you call 871-8888 for additional information and to schedule your free estimate!